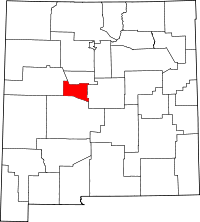 Valencia County, one of the smaller counties in New Mexico as far as actual land area, used to be considerably larger. In 1981, over 80% of Valencia was split off to form the neighboring Cibola County. Within the county are three local Catholic parishes that all have a huge amount of records on file. Death, marriage, and baptism records all date as far back as the late 1700s up to the mid 1900s. They are all preserved on microfilm and are all available for research. The County Clerk's office is in the county seat of Los Lunas, NM; that office serves as the official repository for a number of records including marriages and property transactions. The department also offers a public look-up service that provides free online access to a number of the records the office has on file.